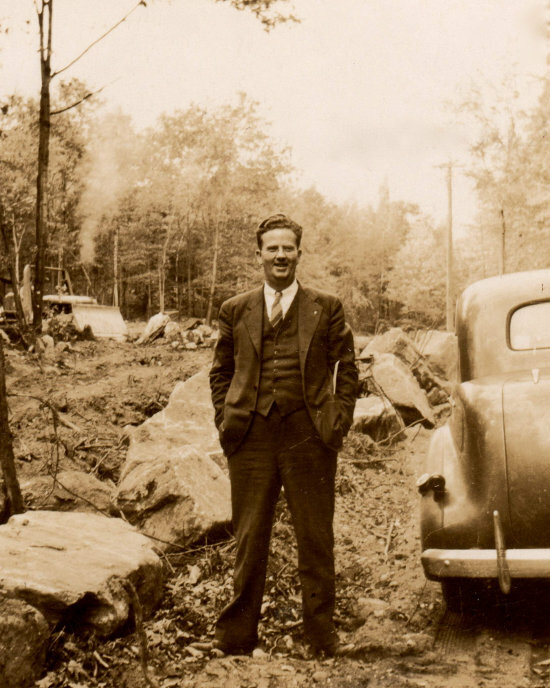 When the Northern Litchfield County Council’s executive, Merle Hildreth, was hired in 1942, among his first tasks was to develop a plan to grow the council. In addition to increasing enrollment and developing the nascent Cubbing program, this five-year plan also included improvements at Camp Workcoeman. Chief Hildreth worked with the newly elected Council President Edward Diddler and Finance Chairman Floyd Pearce to raise $10,000 to upgrade camp. The National Council’s Engineering Division and its Health and Safety Service visited Camp and proposed new constructions. The Council also worked with local foresters to create a land management plan, and for each of the five years, Scouts planted 1,000 trees at camp. The money slowly trickled in and a new waterfront, a Cook’s Cabin, and the Tunxis Campsite were built, but the largest expansion was the following year. As the United Nations edged closer to victory during 1945, the prospects for a brighter future caught on in Northwest Connecticut. That year, the Northern Litchfield County Council recruited enough boys to complete its five-year plan—in three years. The funds that the council raised that year also allowed it to complete a new parking area to the South of the Parade Ground, a Chief’s Cabin near the water’s edge, a Pioneer Campsite, and a Scoutmasters' Cabin in the former Rocky Ledge Campsite. These were not simply housing, but included program components as well. For example, the Scoutmasters' Cabin was not a place for the Scoutmasters to sleep, but an incentive to attend camp with their troop. Troop 15 of Cornwall attended camp as a troop in the late 1930s, and the Scouts in Troop 2 of Torrington and Troop 34 of Winsted usually went in their regular patrols, but since 1924, most Scouts attended as individuals. Chief Hildreth wanted the summer program to better compliment the troop’s year-round program; a troop that attended camp in a body, with all of its patrols, could develop into a better, more organized unit. As an inducement, a Scoutmaster who came to camp with his whole troop could bring along his wife and other family members; these non-Scouts could take their meals in the Dining Hall and stay in the Scoutmasters' Cabin for a vacation along West Hill Pond. Even with the many new constructions at camp and the new unit emphasis, much of the camp program followed the lines of the twenty years prior. The new program of 1943 did not catch on, and the themed weeks were set aside. The emphasis on scoutcraft basics and a few of the special events, however, remained. For instance, during the first week of camp in 1945, the campwide game was “the conquest of Mars.” For Monday afternoon, half the Scouts were Martians and successfully repelled an attack by the other half of camp—Earthmen who tried to land their stratoplane on the surface of Mars. Overall, the traditional stress on aquatics and athletics returned for the 1945 season, even if a number of Scouts attended in a new context, with their troop. The mid 1940s camp expansion prepared Workcoeman for the post-war period, such as the new parking lot, which accommodated the suburbanization of the 1950s. In addition, many of the donations for the campaign came in the form of war bonds, which could supply funds for Camp Workcoeman into the coming decade. The image below shows Chief Hildreth during the construction of the parking area, in front of what is now the Trading Post.